Have been monitoring this for months was at 32.99 since early year and hasn't dropped to this price for a while. Grab a bargain for this rare gem only available on PSN for PS3 before Yakuza 6 comes out next year. One of the weaker mainline installments in the Yakuza series. It's VERY bloated and goes on way longer than it should. Still worth buying at that price though, especially for anyone who's become a fan lately after playing 0 and Kiwami. Almost voted cold for overuse of the word rare... but that is a very good price for it. ‌ Its too much for a physical copy now so it's a good post. Loads of Ps3 and a fair few Vita games on sale at the moment, which is always nice. What a deal! Amazing price! Brilliant game, most would of got it when it was free on ps plus but this is a great price for people who missed it. One of the weaker mainline installments in the Yakuza series. It's VERY …One of the weaker mainline installments in the Yakuza series. It's VERY bloated and goes on way longer than it should.Still worth buying at that price though, especially for anyone who's become a fan lately after playing 0 and Kiwami. I’ve been playing for dozens of hours and still only on Saejima. Spent waaaaaaay too long doing Kiryu’s taxi stuff. Can't agree enough, kind of enjoyed Kiryuu's bit, but Saejima's section just doesn't seem to end. One of the weakest? It's one of the best so far, considering the content of the game and the amount of things you can explore (5 cities). It also has the most mini games (like pachiko, slots, taiko, table tennis, dance dance revolution style music rthythm games as well as taxi driving and snowball fight!) you can't find them on most other installments. The worst imo is yakuza dead souls and yakuza 6. Finished yakuza 6 more than a year ago the content was disappointing despite better rendering. I liked 5. Good breadth of content, and with the gap between releases at least back then, length didn't matter as you could take your time with it without falling behind. I really want them to remake 3, 4 and 5 in the new engine. One of the weakest? It's one of the best so far, considering the content …One of the weakest? It's one of the best so far, considering the content of the game and the amount of things you can explore (5 cities). It also has the most mini games (like pachiko, slots, taiku, table tennis, as well as taxi driving and snowball fighter !) you can't find them on most other installments. The worst imo is yakuza dead souls and yakuza 6. Finished yakuza 6 more than a year ago the content was disappointing despite better rendering. Take it the version of yakuza 6 you played was the Japanese game, can I ask does this have the English subtitles included? If so I will probably get it from there and play it 3 months early. Take it the version of yakuza 6 you played was the Japanese game, can I …Take it the version of yakuza 6 you played was the Japanese game, can I ask does this have the English subtitles included? If so I will probably get it from there and play it 3 months early. umm i don't know sorry. the version I bought was traditional chinese version. It's not dubbed but with chinese subtitles. Hope there will be English subtitles when it comes out. Brilliant deal, would've got it if I hadn't already finished it via PS+. Great entry into the Yakuza series, offered plenty of things to do but you can skip most of it if you wanted to rush the story but it's best left to take your time over it. Took me two months playing it a few hours every other day. Yakuza 0 was much shorter but more polished but the story was more memorable in Y5. Almost voted cold for overuse of the word rare... but that is a very good …Almost voted cold for overuse of the word rare... but that is a very good price for it. ‌ Its too much for a physical copy now so it's a good post. 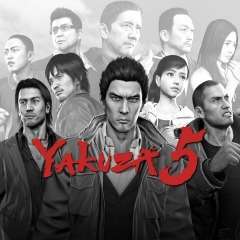 Yakuza 5 was never released in English physically. Plenty of people speak more than one language. I also have a lot of Japanese ds games. Deal posting newbie! This is Haider_Sarwar first deal post. Help out by leaving a posting tip or just to show your appreciation for their contribution.